Thank you to everybody who donated to this appeal. Please bear in mind that this is an old blog post from 2016 and this appeal is now over. However, there are always many children’s charities and local children’s hospitals who would be grateful for any donations of toys. So please consider contacting them directly if you would like to consider donating any toys. 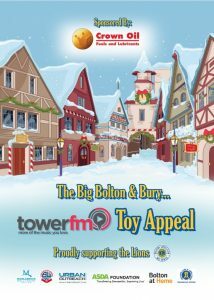 Crown Oil is teaming up with Tower FM for The Big Bolton & Bury Toy Appeal 2016. From Friday 11th November, Crown Oil will be collecting toys on behalf of several charities throughout Bolton and Bury. We will be joined by the likes of Asda, Bolton Wanderers FC, and Middlebrook Retail and Leisure Park as part of the appeal. To kick things off, Tower FM will be broadcasting a special show live from Crown House on Friday morning. To get into the Christmas spirit, the staff at Crown House will also be wearing Christmas jumpers as part of the event. Crown House on Heap Brow in Bury will also be one of the drop-off points for donations throughout the appeal. Donations to The Toy Appeal are being accepted until Sunday 11th December. So when you’re doing your Christmas shopping, please help the campaign by purchasing just one toy and bringing it to Crown House or one of the other available drop-off points. All toy donations are welcomed and greatly appreciated. Dig deep and donate what you can! And don’t forget to listen to Tower FM’s live show from Crown House on Friday 11th November!